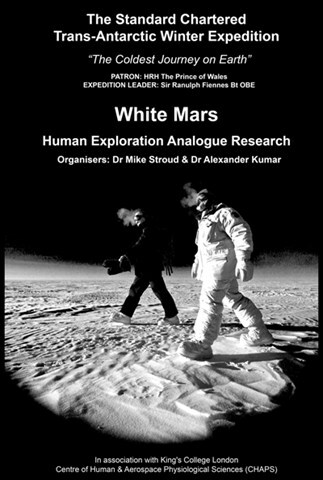 The Coldest Journey has created a unique opportunity for a substantial Human Sciences research project which has is being organised by Dr Mike Stroud and Dr Alexander Kumar. The work itself will be undertaken in Antarctica by Dr Rob Lambert, the expedition doctor. Prolonged period of complete isolation: The traverse team will be alone on the ice from at least March to October 2013 and the isolation experienced will be truly “real” since there will be no opportunity for evacuation during the Antarctic winter. Altered day-night cycle: The team will experience three to four months of complete darkness enabling research in relation to measurable changes in circadian rhythm. Chronic hypobaric hypoxia: The expedition will encounter altitudes up around 3,200 meters and furthermore, the extreme cold temperatures and the lower gravitational field at high latitudes will further decrease atmospheric pressure, creating low oxygen levels equivalent to those of more than 3,800-meters altitude. Exposure to extreme environments: The Antarctic Plateau is the world’s largest desert exposing the team to both extreme cold and low humidity. Working to strict weight, volume and even power availability restrictions, 20 institutions from across Commonwealth countries, ranging from University of Oxford to the University of Manitoba (Canada), have accepted the challenge of designing minimally invasive and compact experiments to produce maximally beneficial results. By contributing toward an integrated protocol involving blood sampling, exercise tests and various other psychological tests on the team before, during and after the expedition, they hope to make unique discoveries about how humans adapt to such extreme conditions. Specific areas of study will focus on elements of extreme physiology and psychology and are to include monitoring of nutritional status, hormone levels and changes in circadian rhythm, vitamin D, immunological changes, blood clotting, sleep patterns, ophthalmological impact, as well as microbiological changes in relation to isolation and cardiac and neurocognitive deconditioning.